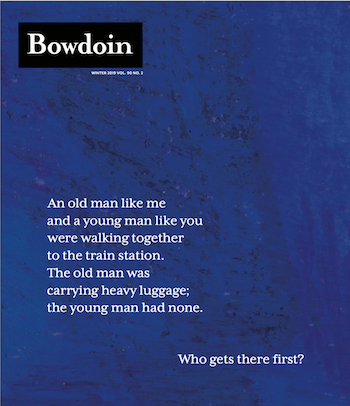 We publish Bowdoin Magazine three times a year and send it free of charge to all Bowdoin alumni, parents of current and recent undergraduates, members of the senior class, faculty and staff, and members of the Association of Bowdoin Friends. Professor Fritz Koelln, an intellectual whirlwind and deeply kind soul, imparted more than a life's worth of lessons to his student and friend Neill Reilly '71. Head cross-country skiing coach Nathan Alsobrook '97 has a winning formula with a not-so-secret key ingredient. Denise Moriguchi ’98, president and CEO of Seattle’s famous Uwajimaya, balances a remarkable history with necessary change. Respond: Read letters from our readers. A Family Affair: Mother-daughter duo Lisa and Stephanie Rendall talk College connections. Bowdoin Reads: A popular Library blog celebrates ten years. Robert Packard ’58 climbs high points and takes numbers. Carrie Niederman ’82 cares for horses' teeth in Texas. Joe Adu ’07 takes a human approach to technology. Higher Ed in Flux: Professor Charles Dorn talks about the state of higher education. Please send address changes, ideas, or letters to the editor to bowdoineditor@bowdoin.edu. Send class news to classnews@bowdoin.edu.